Working together is one of the most important success factors in an agile team. Individual work will not be enough to deliver all the user stories before the sprint is finished. Daily standups help to foster this communication, but it has to be a focus throughout the entire working day. That’s why it is useful to focus on this principle once in a while during a retrospective. Helping Hands is a useful exercise that gets people thinking about the objectives of their own role and how they can help others to reach theirs. As a facilitator, you start by drawing a pivot table that contains all the different team roles. You explain that the team first needs to fill in the objectives of each role. 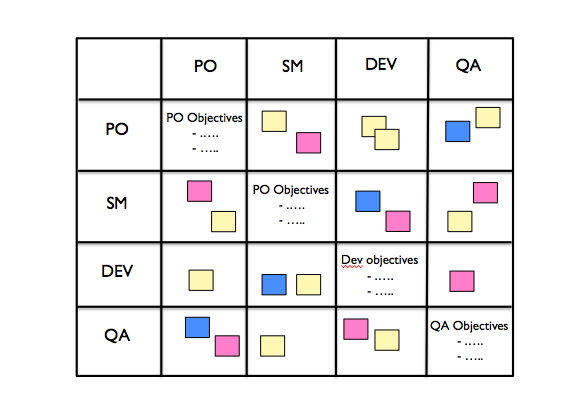 Roles that are filled in by 1 person (such as PO and SM) can write their objectives down on the pivot table, others will have to discuss in group first (ex. developers). The next step is to think about what you can do to help other roles to reach their objectives. This can be a quiet exercise, where each individual uses post-its to write down what actions they see fit. After 5-10 minutes, we start filling the boxes of the pivot table with post-its and discuss. We read the table horizontally, from left to right. This example shows what a Scrum master can do for the other roles in the team. Participants often learn that they have a big impact on the success of others and that their help is necessary on a daily basis. This exercise will give your team insights, which can lead to process improvements.